When you have two similar Excel workbooks, or better say two versions of the same workbook, what's the first thing you usually want to do with them? Right, compare those files for differences, and then probably merge them into a single file. In addition, workbook comparison can help you spot potential problems like broken links, duplicate records, inconsistent formulas or wrong formatting. So, let's have a closer look at various methods to compare two Excel sheets or entire workbooks and identify differences between them. If you have relatively small workbooks and a sharp eye for detail, this quick and easy way to compare Excel files might work well for you. I am talking about View Side by Side mode that lets you arrange two Excel windows side by side. You can use this method to visually compare two workbooks or two sheets in the same workbook. Let's say you have sales reports for two months and you want to view both of them simultaneously to understand which products performed better this month and which did better last month. Open the workbooks you want to compare. Go to the View tab, Window group, and click the View Side by Side button. That's it! By default, two separate Excel windows are displayed horizontally. As the result, two separate Excel windows will be arranged side by side, like in the below screenshot. If you want to scroll through both worksheets simultaneously to compare data row-by-row, make sure the Synchronous Scrolling option it turned on. This option resides on the View tab, in the Window group, right under the View Side by Side button, and is usually turned on automatically as soon as you activate View Side by Side mode. 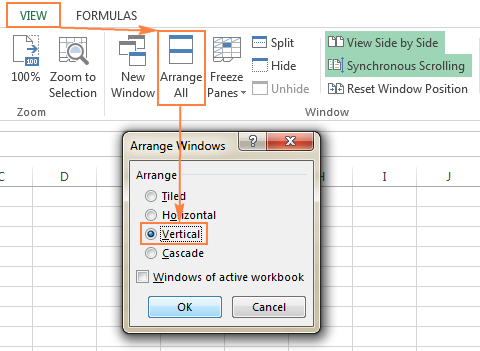 For more information about using this Excel feature, please see View Excel workbooks side by side. 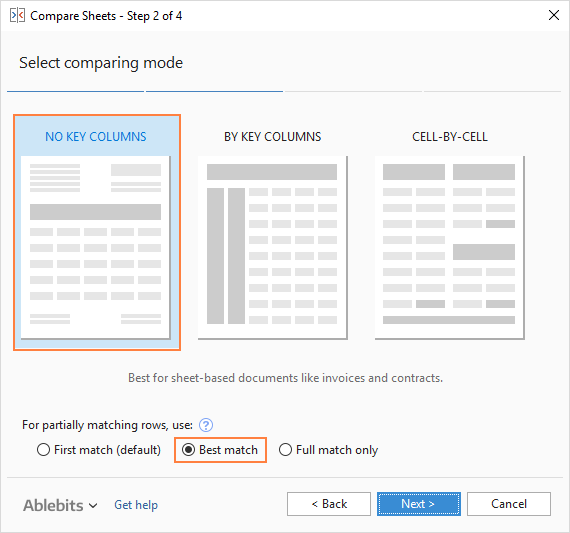 To view more than 2 Excel files at a time, open all the workbooks you want to compare, and click the View Side by Side button. The Compare Side by Side dialog box will appear, and you select the files to be displayed together with the active workbook. 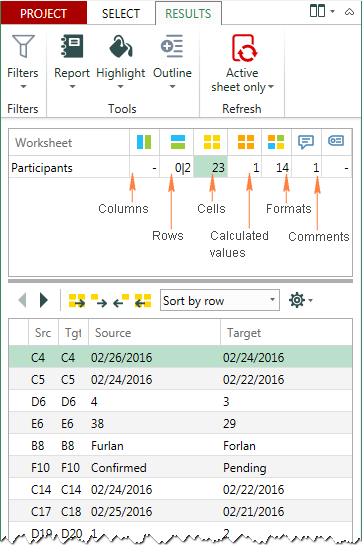 To view all open Excel files at a time, click the Arrange All button on the View tab, in the Window group, and choose your preferred arrangement: tiled, horizontal, vertical or cascade. Sometimes, 2 sheets that you want to compare reside in the same workbook. To view them side by side, perform the following steps. Open your Excel file, go to the View tab > Window group, and click the New Window button. This will open the same Excel file in a different window. Enable View Side by Side mode by clicking the corresponding button on the ribbon. Select sheet 1 in the first window and sheet 2 in the second window. It is the simplest way to compare data in Excel that lets you identify cells with different values. As the result, you will have a difference report in a new worksheet. As you can see in the above screenshot, the formula compares 2 sheets, identifies cells with deferent values and displays the differences in corresponding cells. Please note that in the difference report, dates (cell C4) are presented by serial numbers as they are stored in the internal Excel system, which is not very convenient for analyzing differences between them. In the worksheet where you want to highlight differences, select all used cells. For this, click the upper left cell of the used range, usually A1, and press Ctrl + Shift + End to extend the selection to the last used cell. Where Sheet2 is the name of the other sheet you are comparing. If you are not very familiar with Excel conditional formatting, you can find the detailed steps to create a rule in the following tutorial: Excel conditional formatting based on another cell value. 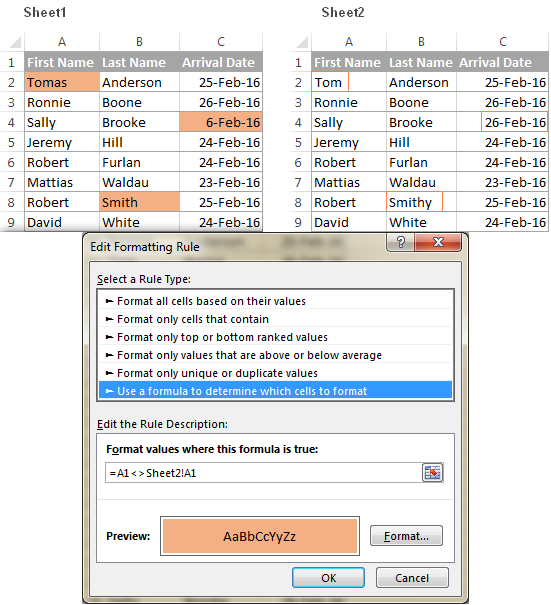 They find differences only in values, but cannot compare formulas or cell formatting. They cannot identify added or deleted rows and columns. As soon as you add or delete a row / column in one sheet, all subsequent rows / columns will be marked as differences. They work on a sheet level, but cannot detect workbook-level structural differences such as sheet additions and deletions. Share your Excel workbook before you make it available to other users. To share a workbook, just click the Share Workbook button on the Review tab, in the Changes group, select the Allow Changes by More Than One User… box, and click OK. Allow Excel to save the workbook if prompted. Turning on the Track Changes feature shares the workbook automatically. Each person who makes any edits to the shared workbook must save a copy (.xls or xlsx file) using a unique file name. Now that all initial preparations are done properly, you are ready to combine the copies of a shared workbook. Open the Quick Access drop down menu and select More Commands. In the Excel Options dialog box, select All Commands under Choose commands from. In the list of commands, scroll down to Compare and Merge Workbooks, select it and click the Add button to move it to the right-hand section. When all of the users have finished working with your shared Excel workbook, you can merge all the copies into one file. Open the primary version the shared workbook. 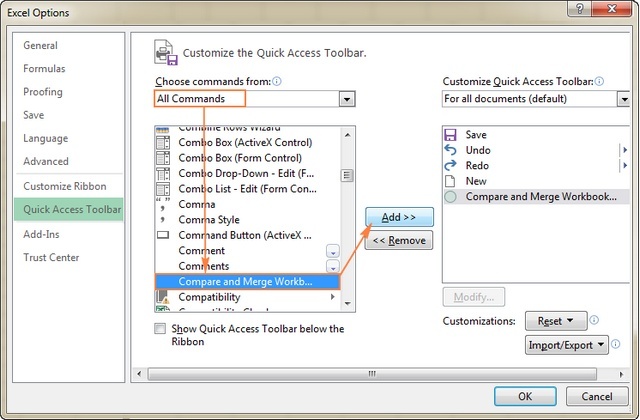 Click the Compare and Merge Workbooks command on the Quick Access toolbar. 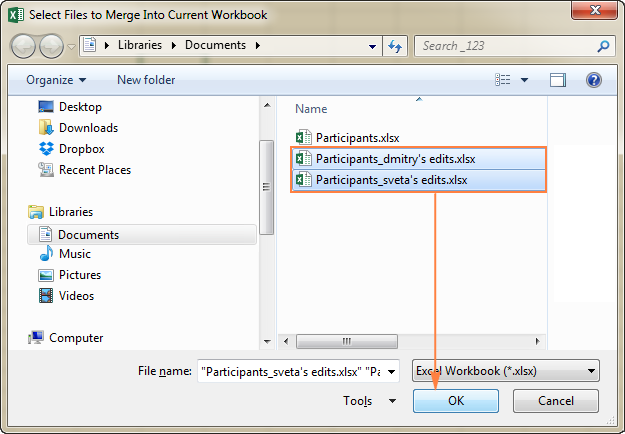 In the dialog box that appears, select a copy of the shared workbook that you want to merge. To select several copies, hold the Shift key while clicking the file names, and then click OK. Done! The changes from each copy are merged into a single workbook. Switch to the Review tab > Changes group, and click Track Changes > Highlight Changes. In the Highlight Changes dialog, select All in the When box, Everyone in the Who box, clear the Where box, select the Highlight changes on screen box, and click OK.
To point out the row and columns with differences, Excel highlights the column letters and row numbers in a dark red color. At the cell level, edits from different users are marked with different colors. To see who made a specific change, just hover over the cell. Note. If the Compare and Merge Workbooks command is greyed out in your Excel, most likely you are trying to combine different Excel files. 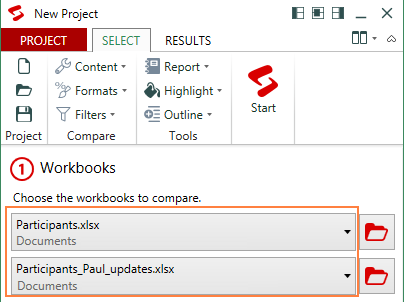 Please remember, the Compare and Merge Workbooks feature allows merging only copies of the same shared workbook. As you have just seen, Microsoft Excel provides a handful of features to compare data in two or more workbooks. But none of the built-in options is sufficient to comprehensively compare Excel sheets, let alone entire workbooks, spotting all the differences in values, formulas or formatting. So, if you need advanced and really efficient means to compare two Excel files, then most likely you would have to use one of the third-party tools specially designed for comparing, updating and merging Excel sheets and workbooks. Below you will find a quick overview of a few tools that, in my opinion, are best performers in this area. The Synkronizer Excel Compare add-in can quickly compare, merge and update two Excel files saving you the trouble of searching for differences manually. Identifying the differences between two Excel sheets. Combining multiple Excel files into a single version without producing unwanted duplicates. Highlighting the differences in both sheets. Showing only the differences that are relevant to your task. Merging and updating the sheets. Presenting detailed and easy to read difference reports. To get some basic idea about Synkronizer Excel Compare's capabilities and performance, let's carry out a couple of field tests. 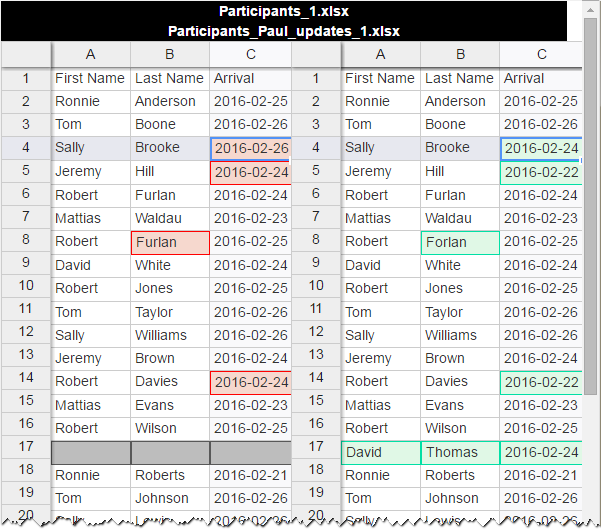 Supposing you are organizing some event and, in your Excel table, you gather information about the participants such as a participant name, arrival date, number of seats, etc. Also, you have a couple of managers in direct contact with participants and the database, and as a result, you have 2 versions of the same Excel file. Okay, let's see how efficiently Synkronizer can compare our two sheets and identify differences between them. To run Synkronizer Excel Compare, go to the Add-ins tab, and click the Synchronizer 11 icon. 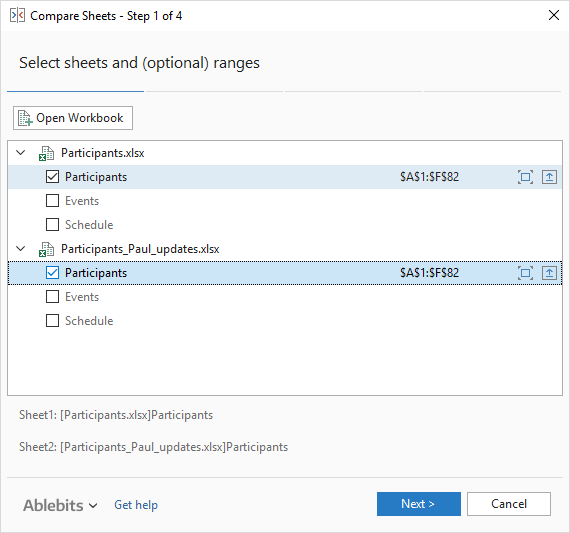 If the selected workbooks have any sheets with the same names, all those sheets will be matched and automatically selected for comparison (like Participants sheets in the below screenshot). Also, you can select worksheets manually or instruct the add-in to match sheets by other criteria, for example by worksheet type - all, protected, or hidden. 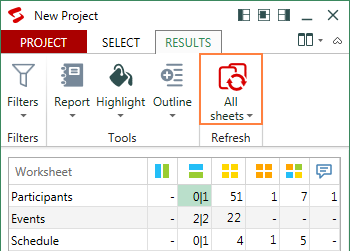 Once you've selected the sheets, the Synkronizer add-in will open them side by side, arranged vertically or horizontally, like in Excel's View Side by Side mode. Compare as normal worksheets - the default option that works in most cases. Compare with link options - if the selected sheets do not contain any new or deleted rows and columns, you can compare them "1 on 1". Compare as database - recommended for comparing sheets that have a database structure. Compare selected ranges - if you do not want to compare the entire sheets, define the ranges to be compared. Choose the content types to be compared (optional). Under Content, you can select comments and names (in addition to cell values, formulas and calculated values that are compared by default). Under Formats, you choose what cell formats such as alignment, fill, font, border etc. The Filters option lets you filter out differences that you don't want to display. For example, you can ignore case, leading or trailing spaces, all formulas or different formulas with the same result, hidden rows or column, and more. Finally, click the big red Start button on the ribbon and proceed to examining the results. In a summary report, you can see all difference types at a glance: changes in columns, rows, cells, comments, formats, and names. To view the detailed difference report, just click a specific difference type on the summary report. The merge function is definitely one of the most useful features of the Synkronizer Excel Compare add-in. 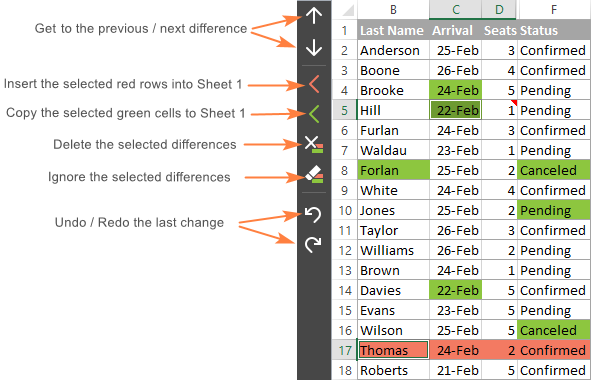 You can transfer individual cells or move different columns/rows from the source to target sheet, and have your primary sheet updated in seconds. Well, these are the key features of the Synkronizer add-in, but there is certainly much more to it. Want to give it a try? An evaluation version is available for download here. Synkronizer is certainly worth your attention, but it's not the only way to compare files in Excel. A handful of other comparison tools exist, which basically provide the same set of features but in different implementations. The latest version of our Ultimate Suite includes over 40 new features and improvements, the most exciting of which is Compare Sheets - our own tool to compare worksheets in Excel. A step-by-step wizard walks you through the process and helps configure different options. You can choose the comparison algorithm best suited for your data sets. 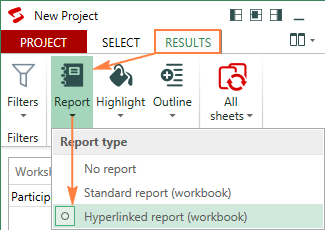 Instead of a difference report, the compared sheets are displayed in the Review Differences mode so that you could view all the differences at a glance and manage them one-by-one. Now, let's try the tool on our sample spreadsheets from the previous example and see if the results are any different. The wizard will show up asking you to select the two worksheets you'd like to compare for differences. No key columns (default) - works best for sheet-based documents like invoices or contracts. By key columns - is appropriate for column-organized sheets that have one or more unique identifiers such as order numbers or product ID's. Cell-by-cell - best to be used to compare spreadsheets with the same layout and size, like balance sheets or year-to-year reports. Tip. If you are unsure which option is right for you, go with the default one (No key columns). Whichever algorithm you select, the add-in will find all the differences, it will only highlight them differently (entire rows or individual cells). First match (default) - compare a row in Sheet 1 to the first found row in Sheet 2 that has at least one matching cell. Best match - compare a row in Sheet 1 to the row in Sheet 2 that has the maximum number of matching cells. Full match only - find rows in both sheets that have exactly the same values in all the cells, and mark all other rows as different. Finally, specify which differences to highlight and which to ignore, and how to mark the differences. Click the Compare button and allow the add-in a couple of minutes to process your data and make the backup copies. Backups are always created automatically, so you may not worry about the safety of your data. Blue rows - rows that exist only in Sheet 1 (on the left). Red rows - rows that exist only in Sheet 2 (on the right). 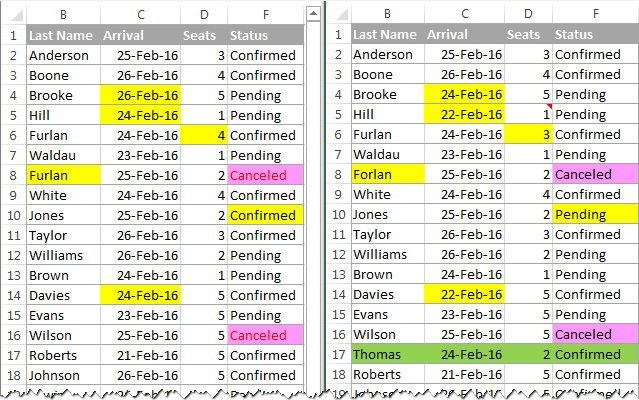 Green cells - difference cells in partially matching rows. To help you review and manage the differences, each worksheet has its own vertical toolbar. For the inactive worksheet (on the left) the toolbar is disabled. To enable the toolbar, just select any cell in the corresponding sheet. As soon as the last difference is dealt with, you will be prompted to save the workbooks and exit the Review differences mode. Restore the original workbooks from the backup copies. That's how you compare two sheets in Excel with our tool (hope you liked it :) If you are curious to give it a shot, an evaluation version is available for download here. Find duplicate records between two worksheets and remove them. Update all existing records in one sheet with values from another sheet. Add unique (new) rows and columns from one sheet to another. Merge all updated records from one workbook to another. Sort data on the sheets by the key column. Filter the comparison results to display differences or identical records. Highlight comparison results with colors. DiffEngineX is another utility that can help you identify differences between cell values, formulas, comments, Excel names, and VBA code. It can compare two Excel workbooks or selected sheets. DiffEngineX works with xls, xlsx, xlsm and xlsb files, and supports Excel 2013, Excel 2010, Excel 2007 and Excel 2003. Find differences between 2 sheets in formulas and values. Identify layout changes, including added / deleted rows and columns. Recognize embedded objects such as charts, graphs and images. Create and print difference reports of formula, value and layout differences. 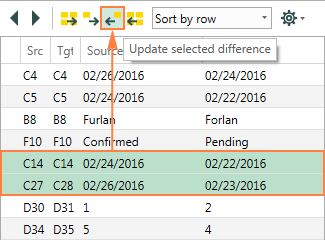 Filter, sort, and search the difference report on key changes. Compare files directly from Outlook or document management systems. Support for all languages, including multi-byte. Apart from desktop tools and utilities, there exist a number of online services that let you quickly compare two Excel sheets for differences without installing any software on your computer. Probably it's not the best solution in terms of security, but if your Excel files do not contain any sensitive information why not use some free online service for immediate results? Well, this is how you can compare Excel files for differences. If none of the solutions described in this tutorial is suitable for your task, check out the following resources that cover other aspects of Excel file comparison. And if you know any other ways to compare two Excel files, your comments will be greatly appreciated. I thank you for reading and hope to see you on our blog next week! Compare two columns in Excel for matches and differences - demonstrates several techniques to compare two columns and find matches and differences between them. 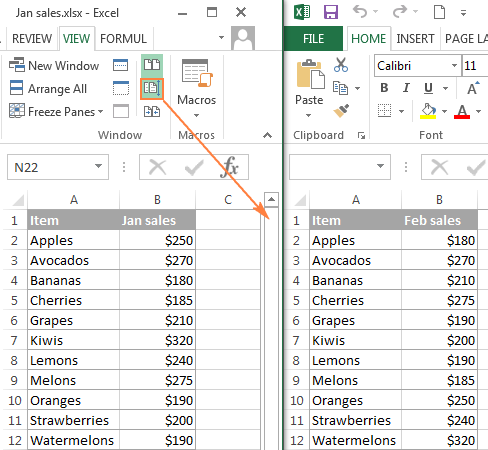 Consolidate data in Excel & merge multiple sheets into one - explains different ways to combine sheets in Excel - consolidate data from multiple worksheets, combine several sheets by copying their data, and merge two sheets by the key column. 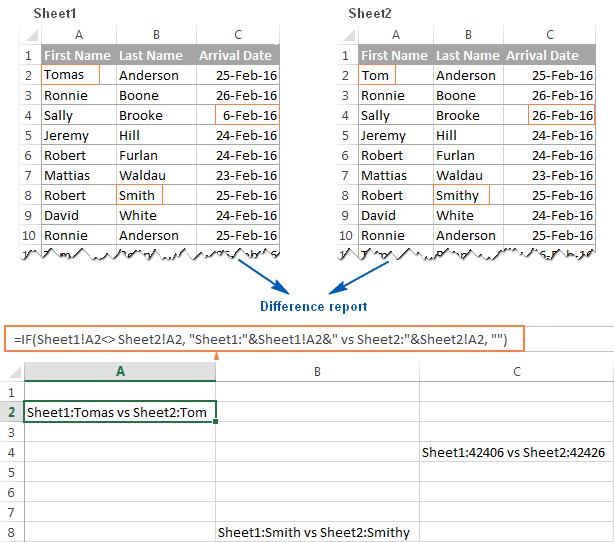 Merge Tables Wizard for Excel - match and merge two sheets by the key column(s). Duplicate Remover Wizard for Excel - compare two sheets for duplicate and unique values. 98 Responses to "How to compare two Excel files for differences"
and leave Sheet3 as it is without renaming (Sheet3), Then the above mentioned formula will reference to sheet3 itself. Solution: try the formula without renaming! Thank you for making great content! I've tried "How to compare two Excel sheets for differences in values" and "Highlight differences between 2 sheets with conditional formatting." My issue is the source file row counts grow over time which means as new rows are inserted alphabetically, Conditional Formatting thinks there's a change to report. Is there a way to compare row by row and only report on those changes? My brain envisions a complicated 'match if' to isolate changes versus the same row data that just happened to get moved down a couple rows. Thank you for your kind feedback. I believe a specialize tool like Syncronizer would be the best solution for this kind of task. The above article shows how to compare the values in 2 columns, but this approach also works for comparing 2 different worksheets. 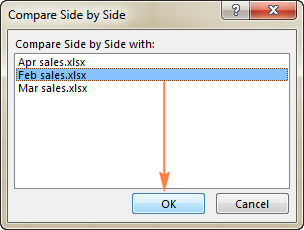 Could you please advise on what to do when Compare and Merge and Workbooks button appears inactive on the ribbon? I've added the Compare and Merge Workbooks command to a custom group on the Review ribbon. However, the added command is grayed-out. In most cases, the Compare and Merge and Workbooks button is grayed out when you are trying to combine different Excel files. 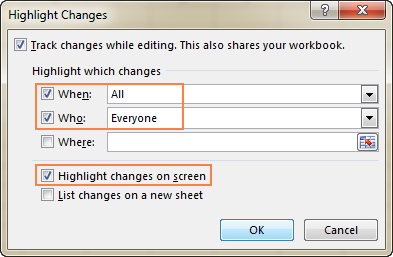 Please remember, this feature allows merging only copies of the same shared workbook. So, if you want to use Compare and Merge and Workbooks option, share your workbook before making any changes to it (click the Share Workbook button on the Review tab, and select the 'Allow Changes by More Than One User' box). After that different users can edit your shared workbook, and save a copy using a unique file name. Please see the second part of this post for the formula you can use. If your task is different, please describe it in more detail. Thanks for a very insightful post Svetlana. It might be also worth to add that one can compare Excel spreadsheets using sql queries as well. 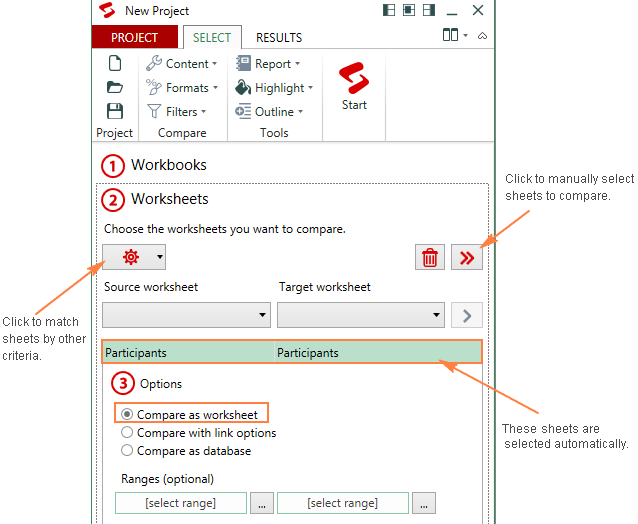 I have tried the "Highlight differences between 2 sheets with conditional formatting", but when I click on the OK button of the "New Formatting Rule" screen, I get an error message saying "You cannot references to other worksheets or workbooks for Conditional Formatting criteria.". I am using Excel 2007. Can you help me out? This is a great content. Increased the productivity. I want to compare two excel worksheets to isolate all email addresses that are on one file, but are not on the other. 24,600 on sheet 1, 19,100 on sheet 2: which are missing on sheet 2? - Choose what you want to do with the found records: highlight the found records with color, select them, or mark them in a status column and click Finish. hi,how to match the info in different sheet in different column?for example i want to test whether if the info in sheet 1 also appear in sheet 2 but in different cloumn and row. THanks for the sharing the tips...really no words to type here to appreciate your provided solution. It was really useful for me where I was not having the textpad to compare the files. i have 2 excel files. It sounds like the Synkronizer tool described in this post is what you need. This is exactly the information I was looking for! Options were presented, they were each explained clearly, and it worked perfectly. i have the data like name of items, price, date in one sheet. And another sheet i have data like name of items, sale on date. I need to know what is the exact price on sale date with related name of items? which function is suitable to find the price? You can also use our Merge Tables Wizard add-in. Thus if values differ in the compared cells, the formula will display the change. hi i have very little know how using excel.can someone assist me with A TEMPLATE that can compares two or more sheets and copy the like data to onother sheet.regards ben. Very helpful. This made it very easy to compare 2 spreadsheets that were allegedly the same but had different time stamps. This resolved all differences quickly. Hi, I have a parts list that is produced on a set format spreadsheet and a second spreadsheet that is used for showing other data but contains the same part numbers not in the same order. Is there a way to search the two DIFFERENT formats of spreadsheets showing part numbers that have changed, (In one but not the other). I'm trying to validate migrated data between two sheets both containing the same number of headings. The rows containing the data however could be missing lines between the source sheet and the target sheet so how to I set a formula to look over a wide range of cells? The examples above have been between the same two cells on each sheet but I need to check the cell on one sheet against a number of cells on another sheet. I have a app in excel that contain 20 different sheets... some of one are menus to navigate thought the workbook.... The principal WB its a shared WB an there are 8 copies of the WB with different names in the same folder. The folder contain only the original an copies of the app wb. I need a code in vba to compare and merge the different workbooks that contain the folder with the open copy in automatic way, without the specific user have to select the other copies to compare an merge. In this moment I don't have a previous code to show you. How about "side by side" for MacIntosh? 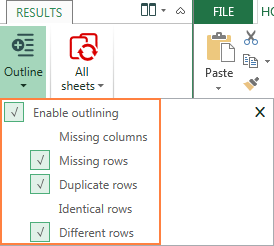 I tried the conditional formatting technique, however Excel generates an error saying that referencing different worksheets is not allowed with conditional formatting formulas. I have tried "Highlight differences between 2 sheets with conditional formatting", it worked but the data in two sheets that I have used are not in same order. For example one sheet in alphabetical order by name and other by IDs. How to compare two sheets when the data is not in same order? Microsoft has now a very comprehensive tool for comparing two Excel spreadsheets for differences. Home-grown solutions are not required. Upgrade to Office 365 ProPlus. I am trying to compare data from two workbooks. looking up Book1 column C and E to Book2 column L and B then matching those columns within the same row to what is in Book2 column N? I would like to compare two excel files , which has many sheets within and merge it in the base file. These are not shared workbook but people have modified and saved it in different name. It would be of great help, if you could help out on this. I am sending files which has different cell values , i want Highlight the cell which has got new value . i mean to say , cell color should change if any one changes that cell value . How to compare two excel file with different cell addresses ? Will above mention solution work if the cell address of two excel sheet are different? This is a useful information. Sometimes i have to compare two unsorted large files with many columns(say 100 columns) and it will be difficult for me to sort both the files before comparing it. (i use custom sort but it takes lot of my time and effort). So do you have better and efficient solution for this problem which can easy my task. I needed to compare two sheets and spent about 30 min writing code in Stata to do it. Then, even though I knew there were no differences, I decided there must be an easier way and found your tutorial. It took about 1 minute using conditional formatting. I never would have thought to look for that. Thank you! For small worksheets, rather than side-by-side comparison, I open both files and display them full page. Then I switch back and forth between them using Ctrl-F6, and differences are easy to see as they literally "jump out." Make sure column sizes are the same. HI, I'm trying to compare two sheets to match date and time data. So I have one sheet with phone response times and another with TV advert times and I want to match up the phone response with the TV adverts that went out within 8 minutes of that advert. Do you know what sum I should use? Thanks! it's very difficult to come up with any particular formula since we don't know how your data is stored. If you could send us a small sample workbook with data and the result you expect to get to support@ablebits.com, we would be able to suggest you better. If you send the file, don't forget to link this comment in your email. Hi Svetlana - I have a task to to check for 'new' or 'updates' from the last week's data, and the data is huge, mostly the updates are change in dates, or some minor details. new updates/new info comes in a different workbook each, can you suggest me a quick solution to compare and identify the data between old massive listing and the new short listing of 'new and updated info'? can I amend your above formula to compare between two diff workbooks than sheets? Thanks for your nice post. I am looking for a tool to compare two worksheets that would recongnize if a row (or column) was inserted (or deleted). I have used spreadsheet compare, however that works on a cell by cell comparison. If one row is inserted that row and all following rows are marked as changed. Do you have any advice? Great post and well explained!!! Can I merge 2 excel csv and get all the different rows as a result? Seems to be possible in Synkronizer but I work on a Mac and this add-on only seem working on windows. Or are there other add-ons available running on Mac who can do this? Thanks for the tips. I used the comparison between two worksheets and it worked perfectly. I am trying to find a duplicate program on Excel like Word Doc compare. Our group sends out budgets to sites and the sites make changes without highlighting the changes. We must go line by line to see if there have been any changes. They also add lines so we cannot compare worksheet to worksheet. Is there an easy way to do this? I need to compare two excel sheets with both sheets have little difference having addition rows and missing rows. in that case how can compare it. Just wanted to say THANK YOU, this works great and saves a lot of work!! Sorry that was a quick post. What I needed was comparing two Excel sheets (a duplicate was created by cloud software and two people had two different versions). So I copied the sheet of one, into the other Excel. And then did the trick highlighting the differences with conditional formatting. Worked out great. I would like to know which of these apps to compare excel workbooks is free? 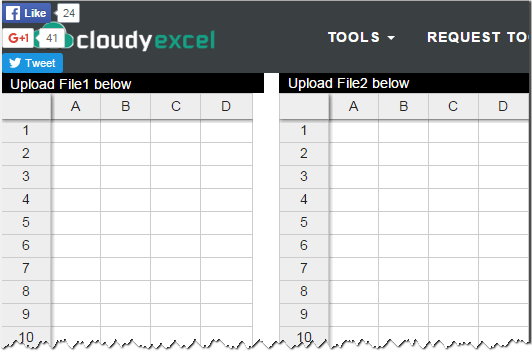 Cloudy Excel worked well for a couple tabs and then crashed and I haven't been able to get it to work again. I'm on Windows 10 with Microsoft Office 365. Thanks if anyone can help! I'm mid-project now and STUCK. Hi i would like to know how to match one sheet to another sheet with all the cells. I need variation for each cells when comparing each sheet. If anyone know please send me the exact formula. Highlight differences between 2 sheets with conditional formatting. I'm currently using these two methods but it seems there is manual work required in that the two sheets' rows must be aligned exactly the same prior to using these formulas? 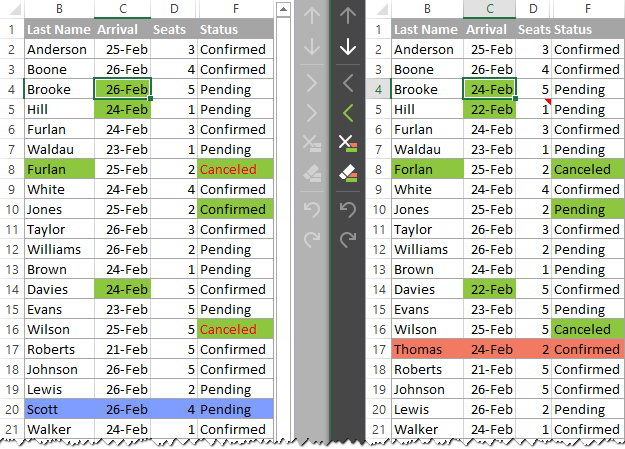 The rows are highlighting with colors showing mismatch even though the data in the rows are are identical in the two sheets while comparing with the "Compare sheets Tab". Kindly revert me back. Please specify what tool you're using to compare your data sets. 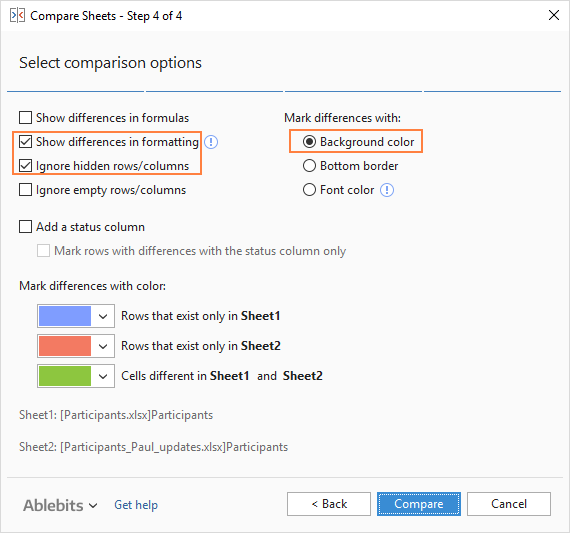 If it is Ablebits Compare Sheets for Excel, then please specify what options you choose on each step of the Wizard and send us your workbook to support@ablebits.com. I kindly ask you to shorten your table to 10-20 rows / columns and include the link to your comment in the email. "...then copy it down and to the right:"
Paste it in cell A1 and then B1, C1, A2, B2,, C2 etc? If that is the case, it doesn't work for me. It copies the same formula in the other cells. Yes, you copy the formula to A2, A3, etc, and then to B2, C2 etc, to as many rows and columns as you want to compare. But you should not paste it in other cells! In Excel, a formula is copied by dragging the fill handle. The detailed instructions can be found here: How to copy a formula in Excel. Because we use relative cell references, the formula will change based on a relative position of the column and row. As the result, the formula in A1 will compare cell A1 in sheet1 and sheet2, the formula in B1 will compare cell B1 in both sheets, and so on. I have two spreadsheets that I Moved into one Worksheet. I have sheet1 that is my original and sheet2 that is from our client with updated amounts of properties. I need to update our original sheet1 with the sheet2 data. I tried if-condition formula i am struggling kindly assit. Awesome help for a non-expert Excel user. THANK YOU! Thank you for the excellent article and for providing your Ablebits Data and Tools add-ins for Excel. I got in trouble recently by unknowingly editing a version of a spreadsheet saved in user\AppData\Roaming\Microsoft\Excel instead of the original file and successfully used Ablebits Data to update the original. Thank you for this great help. Do you know if there is any third party tool for Mac that could do the compare & merge function? I am using Excel 2010 and could not get the Conditional formatting to work at all even when copying formula into the dialog box. To get the IF stmt to work, you will need to format it exactly as written below. There are missing characters in the formula suggested above. Sorry, here's the right formula. Looks like in my previous attempt there was a missing operator. I think this editor doesn't accept the mathematical operator that is used to mean "not equal to" because it keeps removing it. It belongs after =IF('Sheet1'!A1...and is shown correctly in the original formula. Sorry I can't enter it here. One thing is not mentioned. If Microsoft Office 365 or Office Professional Plus 2013 is installed on your computer, the Spreadsheet Inquire add-in is available in Excel. It can do a lot of staff to compare. the advice is very useful, helped a lot, saves hours of work! Anyway we are using the highlighted values, thank you very much! First of all, any line of information is very meaning full. consequently, are they going to function on MacBook as well as windows? 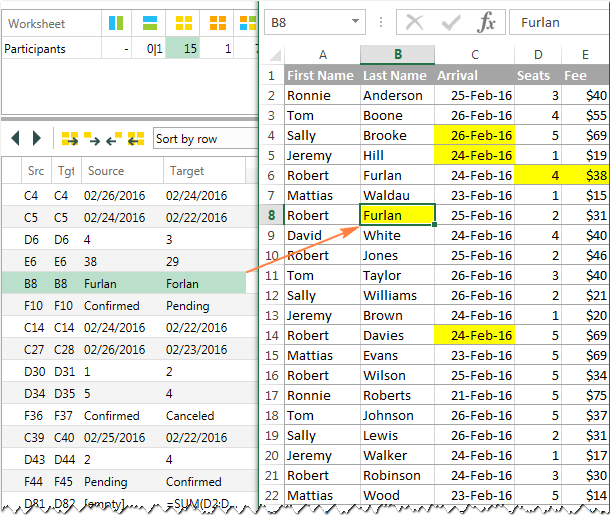 All of the third-party solutions described in this tutorial function in Excel for Windows only. The built-in features will probably work in Excel for Mac too, though we have not tested it. Out blog focuses solely on Excel for Windows, sorry. My issue is I converted 2 large invoices (for 2 different months) from PDF to Excel and I want to see all differences between the 2, almost like a third generated file which has the differences in text and values. Best solution for? Thank you. I am a neophyte in using formulas in excel. In this formula, I have no idea what values to use. Do I assume that [ Sheet1!A1 ] is the name of sheet 1 in my comparison and [ Sheet2!A1 ] is the name of sheet 2 in my comparison? How to I designate the path for the file names? Copy paste your excel files to a word document and then use compare in word. Hi- I have to compare 2 spreadsheets to find discrepancies. The problem with the standard way for our spreadsheets is that since we are receiving it from 2 different sources ( ex. 1 from a client and the other from their payroll company) the same data is called 2 different terms but for our purposes it is actually the same. For examplez the payroll company calls the insurance plan they are on "02371" but the client calls it "PPO". In the normal format, that is a discrepancy. For our purposes this is actually a match. "You may not use references to other workbooks for conditional formatting criteria"
his is after highlighting entire 2-2019 worksheet, and creating new conditional formating rule to "use a formula to determine which cells to format" with "format values where this formula is true" set to =A11-2019!A1 .. where 1-2019 is the worksheet I'm trying to find to compare 2-2019 to.